DoubleD Athlete: Lobsterman Tri- A Tri Bucket List Item DONE! So let's start this off with I HATE CAMPING! I never did it as a kid- my mom despised it so I think that is where I get my hatred from. When a friend asked to have D and I join a bunch of them camping and racing at Lobsterman, with a little convincing we decided to go along. Now I might hate camping but D hates it more than me! And when we arrived in Maine to find out that most of the people had bailed on the camp/race weekend and it was pouring rain I was looking up hotel rates! Anyway we survived a night in a tent. 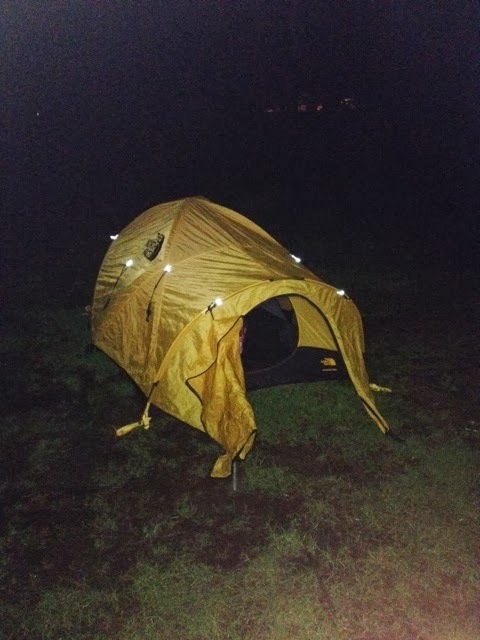 Luckily I happen to have a very nice tent- I know strange for someone who hates camping. It has come in handy at other races too. After a not so decent night sleep on the hard ground we got up early. There was something nice about literally rolling my bike 200ft to transition- so one plus to camping! So from the pouring rain transition was literally a swamp. GROSS! Luckily I didn't have to set up in a puddle or mud. Honestly coming off the high of the previous weekend performance and this being the 5th week in a row of racing for me I was pretty much going through the motions before the race. To be honest I was done. I knew this was it for the season so I wanted to finish strong but part of me thought of leaving on the high note of Hero's the weekend before. My shoulder had now gotten to the point that I was taped up and was getting pain down into my hand from the season of swimming and the 4 previous races taking their toll. This was a mess! Freezing cold ocean water! The caps of previous waves were the same color as the bouys. And look at that time, it is 2 min off my usual half iron swim time. That might give you an indication of how the course wasn't well marked. There weren't enough bouys and the finish arch was black and in the shade. It was so hard to sight this course. I had to have swam long. I was really disappointed with this portion of the race. Which stinks since it is usually my strong part. Run up a hill which was super muddy and grassy. Lovely with your freezing cold feet from the water. My hands weren't working when I got to my bike to take off my cap goggles and wetsuit. I tried to move as fast as I could but it was hard with such cold hands to even buckle my helmet. Who starts a bike course when you are on tri bikes on a dirt road?! The course was hilly. Don't let anyone tell you its rollers. It was flat out hilly. Like wish I had my road bike not my tri bike hilly. There was little places along the course to even get down in aero and hammer. That being said I still managed to pull out 18mph. D went by at some point where I told him how much I was hating the race and he agreed. Maybe I should call this the slow transition race?! Same hill from the swim into transition to rack the bike. This time it was even worse. 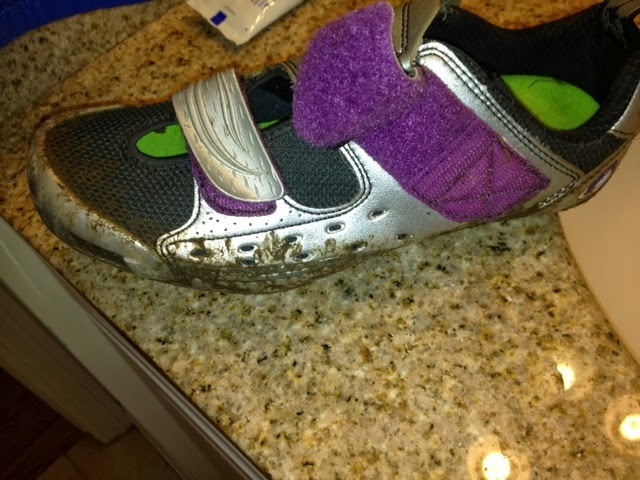 My foot with my cycling shoe fell in to my mid shin a huge mud spot! ARE YOU KIDDING ME???!!!! Actually there may have been a couple cuss words in there too. Okay just grab stuff let's finish this. house in this area of Maine. So I know these roads pretty well. I had a good idea where the run course was going and I knew where I was pretty much the whole time. I knew going out how hilly the run was going to be. So the thought was just finish strong. As I went out I saw Lisa and John. Lisa asked How I was doing? I told her not so great. She said I looked awesome! I told her SHE WAS A LIAR!! I just wanted to be done. I saw D and we did the nod, not much was said we were both pretty cooked. I finished in 3:00 exactly. Not a bad time just not really what I think I am capable of, but I think after 5 races in a row it was all I had left. 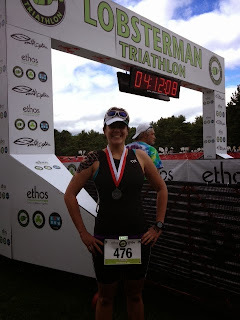 And to be honest the swim was a mess, the bike was pretty good, and the run was horrible. Transition times were slow but transition was HUGE and the grass was a mess! The big draw for this race is the lobster bake after, they don't tell you until you register you have to pay another 25 a person to eat it! Well I knew we could get lobster cheaper close to there. So we hung out for a bit packed up and headed down the road and had lobster at a spot we have eaten at before. 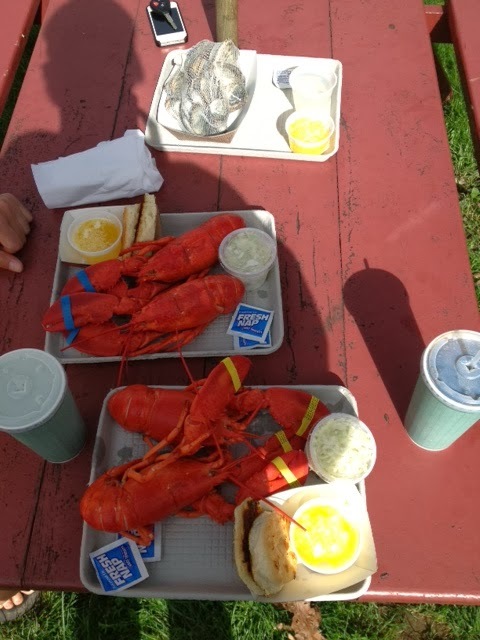 Honestly- I don't really think the race is worth the cost and the big thing of the lobster bake after is not what they make it out to be since you have to pay so much extra for it. Well anyway- I took this one off my bucket list!